We're seeing higher numbers across the board for one of the most interesting weeks in a while. Aside from the obvious ratings win for Princess Agents, The First Half of My Life has been breaking its own records to hit 2.1% and 1.4% in both networks. I knew that Jin Dong has his charms, but I didn't expect a premise about ordinary people going through life changes to do so well. Perhaps it's time to add this to the watchlist? As the newest kid on the block, Boyhood proves its staying power by also breaking 1.0%. Advisors Alliance had its best numbers as well though it settled for 0.9% and 0.5% on its last day of airing. It isn't the end because season 2 will return to continue the story about the Three Kingdoms. A Life Time Love drops two places to rank in seventh likely not through any fault of its own but because competition has gotten too good. 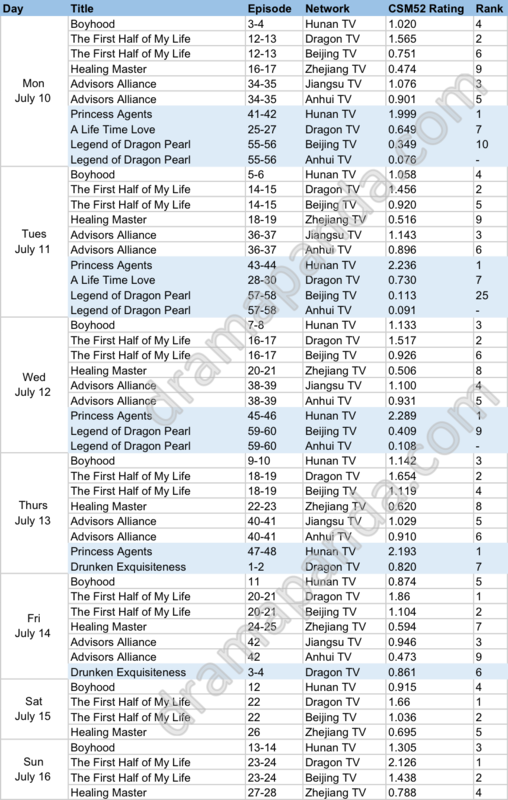 Legend of Dragon Pearl is still at the bottom of the barrel while Lost Love in Times premiered on Thursday to a respectable 0.8% . It's interesting that most of the shows on the 10 pm slot overlap one way or another though the winner remains miles ahead of the rest. The above are mostly primetime shows that air at 19:30 while those highlighted in blue air at 22:00. **Rankings are overall rankings across the shows airing on the same night, regardless of air time. I can't watch The First Half of My Life. From the synopsis, the lead female character goes through a crisis because of her husband's infidelity, and her best friend helps her out of it. Somehow she falls in love with her best friend's boyfriend. It's just too disturbing for me. that sounds horrible. yeah, that is not my type of drama. I'm happy for Jing Dong! He's on a roll. I didn't expect the drama to do well in ratings based on the synopsis but I guess its' really good? Need to check it out. Is anyone watching Lost Love in Times? Do you recommend it? I like the direector and Liu Shi Shi but I'm not keen on William Chan or the costuming so not sure whether to watch or not.